We’ve removed the phrases from the web posting. On behalf of BRAIN I’d like to apologize for a phrase that appeared twice in a Guest Editorial published in our April 1 print issue and on our website this week. The phrase, which appeared twice in the column, was offensive and unacceptable and we regret that it survived our editing process. LEVIS, Québec and LEXINGTON, S.C. (BRAIN) — Sylvain Caya has stepped down as President of HLC (formerly Hawley Lambert Cycling) to pursue other opportunities. Pat McGinnis, currently the VP commercial for the company, is becoming the new president, effective Monday, the company announced. 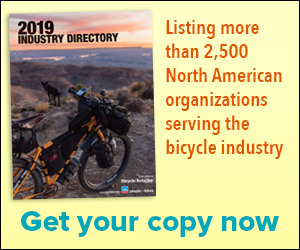 If competition among IBD, EBD and consumer-direct channels for e-bike dominance isn’t enough, there are two more looming market forces to consider. These have the potential to not just disrupt e-bike markets, but to turn the entire Bike 3.0 business model on its head. MONTEREY, Calif. (BRAIN) — Next week at Sea Otter, most consumers will get their first look at SRAM's new Force AXS eTap parts, lower priced versions of the Red AXS eTap parts launched in February. But the new parts became available this week, the same day SRAM publicly unveiled them. The state becomes the second to allow cyclists to treat stop signs as yield signs, and red lights like stop signs. LITTLE ROCK, Ark. (BRAIN) — Arkansas Gov. Asa Hutchinson has signed a bill making his state the second to allow cyclists to roll through stop signs when safe, and to treat red lights like stop signs, proceeding into intersections when safe after stopping, even if the light is still red. WASHINGTON (BRAIN) — QBP is recalling about 1,900 Salsa Warbird Carbon and Salsa Vaya bikes and framesets because the fork legs can break. The distributor has received reports of two breakages, one of which resulted in minor injuries to the rider. NEW YORK CITY (BRAIN) — Two U.S. street artists are suing the British folding bike brand Brompton and 11 of its retailers, charging that the brand used their copyrighted art in social media campaigns without permission or compensation. SAN ANTONIO, Texas (BRAIN) — A 67-year-old woman has been charged with DWI and intoxicated assault in connection with the death of local entrepreneur Tito Bradshaw, who died after being struck by a car while bicycling early Monday.